I was quite taken with Galaxy Express 999 (Ginga tetsudō 999, 1979) when I saw it for the first time last month. The movie and the DVD are splendid - the film a beautifully animated, uniquely stylized work adapted from Leiji Matsumoto's 1977 manga and, to some degree, a concurrently airing animated television series. The original movie was directed by Rintaro (born Shigeyuki Hayashi) in association with the great postwar filmmaker Kon Ichikawa. It won a well-deserved DVD Talk Collector Series rating. 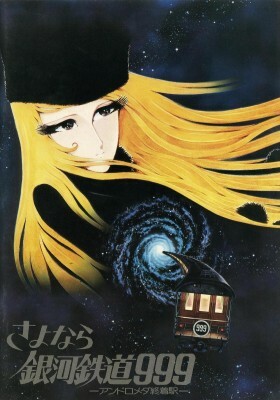 The sequel, Adieu Galaxy Express 999 (full Japanese title: Adieu Galaxy Express - Sayonara, ginga tetsudo 999 - Andromeda shuchakueki, or "Farewell, Galaxy Express 999 - Last Stop, Andromeda," 1981), is a follow-up to the first movie, veering off in directions completely unrelated to the manga and TV series, which must've confused its fans. Adieu is as visually spectacular as the original but otherwise is inferior, and at 135 minutes grievously overlong. And where the first movie is very accessible to those not familiar with the manga or TV show, this sequel is a for-fans-only affair utterly indecipherable to those not already familiar with its characters. It lacks the first film's freshness and startlingly original concepts, and its basic story plays too much like a retread of the first. At times it also plays like sidebar annotations of the first movie's plot points, expanding and explaining concepts best left enigmatic, almost like what the ruinous 2010 did to Kubrick's 2001: A Space Odyssey. Its new story ideas are curiously predictable and derivative. Adieu's two big surprises aren't, one a (Spoilers) reworking of Soylent Green, the other almost identical to the big revelation in The Empire Strikes Back. Still, visually it's a stunner and Discotek Media/Eastern Star's DVD, in 16:9 enhanced widescreen, is terrific. And like it's predecessor it has an especially outstanding stereo surround mix of the Japanese audio (an English-dubbed version is included, but you'll want to avoid that). Extras are limited to a couple of trailers and a still gallery. In a distopian future, 15-year-old Tetsuro Hoshino (voiced by Masako Nozawa in the Japanese version), is a freedom fighter in a rapidly dwindling army of rebel human beings battling robot soldiers and virtually unstoppable flying arsenals amid a bombed-out, post-apocalyptic megalopolis. Sound familiar? The look of these early scenes mirror the post-apocalyptic prologue of The Terminator (1984) almost exactly, even more so than similar footage found in the first Galaxy Express 999. I'm not suggesting James Cameron stole this film's look, but I'd be surprised if it wasn't an influence. In any case the look of these scenes is stunning, especially on big-screen TVs. Tetsuro is given a voice message from Maetel (Masako Ikeda), the rail-thin, pouty-faced young blonde (who strikingly, disturbingly resembles Paris Hilton). The enigmatic princess of the Machine Empire, now rumored to be its queen, instructs Tetsuro to once again board the galaxy-hopping space train 999 ("three-nine"). As before, Tetsuro visits several planets, this time stopping off at La Metal, Maetel's birthplace, where he encounters Meowdar (Kei Tomiyama), a cat-like humanoid. Later on, Tetsuro meets the mysterious, Darth Vader-esque Faust, the Black Knight (Toru Emori). The characters finally converge at the Great Andromeda, the utopian home world of the mechanized empire where ... pretty much the same thing happens as last time. (Spoilers) Adieu Galaxy Express 999 is nothing if not a feast for the eyes and ears. From its Terminator-like opening scenes to its awesome destruction of the mechanized empire, done on a massive scale simply impossible in live-action in those pre-CGI days. The use of "lighting," more John Alton than Walt Disney, and including other cinematic devices like desaturating the color and freeze-framing the action into monochromatic sketches, are unlike anything in American-style animation. The Dolby Stereo mix adds enormously to this, with a full-on aural assault and with excellent use of directional sound and underscoring. But the bloom is off the rose. What was fresh and captivating is now familiar and slow-moving, and rather surprisingly bereft of new concepts. Where the first Galaxy Express 999 offered something new and intellectually intriguing in almost every scene, the sequel is more action-driven and populated by thin, uninteresting characters. Largely absent are the original's existential themes of mechanized immortality vs. humanity mortality, class warfare, and the price of beauty. Too bad. Presented in 16:9 enhanced widescreen, the 1.85:1 Adieu Galaxy Express 999, like its predecessor, looks practically perfect with excellent sharpness, color and contrast. The region 1 encoded disc has knockout stereophonic surround audio for the Japanese language, English (yellow)-subtitled tracks, much superior to the flatter, English-dubbed version. Supplements are limited to a modest still gallery (with no behind-the-scenes shots, sadly) and two interesting Japanese trailers, also enhanced and subtitled, one for this and the first Galaxy Express 999. A big disappointment despite some spectacular visuals, Adieu Galaxy Express 999 seems designed for the franchise's hard-core fans rather than a general movie-going audience. Modestly Recommended. Stuart Galbraith IV's audio commentary for AnimEigo's Tora-san, a DVD boxed set, is on sale now.